Setting your own stones just might be the thing you need to learn this year to set your designs apart from the competition...and it might not be as out-of-reach as you believe! 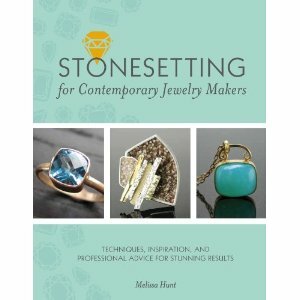 In Stonesetting for Contemporary Jewelry Makers, written by Melissa Hunt for St Martin's Press, you will learn all you need to know about the tools and equipment, and how to chose the very best stone specimins possible for your unique designs. I never really thought through how many different types of settings existed. After a chapter on the basic techniques that are applicable to many of the styles, Melissa covers eleven different "families" of stone settings, like prong and snap, gypsy, claw, pave, and tension settings. It's almost overwhelming, but Melissa explains each style thoroughly. There are step-by-step instructions that explain how to set cabochons, faceted stones, and irregular specimins. There is also a great section in the back that explains the care, maintenance, and repair of finished pieces. Seriously, I have never seen a book like this before, that focuses on everything from ready-made settings to those completely fabricated from scratch. And Melissa shows you how to use these in your designs. My favorite is the gypsy setting, which I'd never heard of by name before. Also known as flush or burnished settings, these "bury" the stone into the thickness of the metal. Very cool-looking, and can be done on a flat or curved surface.